This is the feast date of early Christian martyr St. Euphemia. Euphemia the “All-Praised” (that’s an Eastern construction; both east and west honor her martyrdom on September 16) died in the Asia Minor city of Chalcedon around 307. 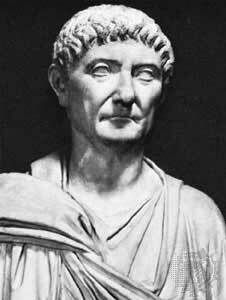 That would place her at the tail end of the Diocletianic persecutions, the part that actually came after said Diocletian retired to his cabbages and left the care and feeding of the eastern empire to Galerius. Euphemia is said to have been the daughter of a senator, but went off and took vows of chastity and avoided sacrificing to Ares. 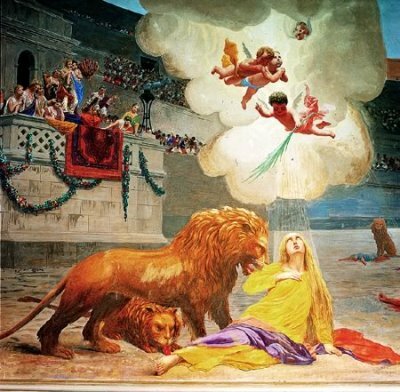 Like many early martyrs, she is supposed to have survived various creative Roman execution attempts thanks to angelic protection, before the pagans just gave up and pitched her into the arena for the classic Christians-vs.-Lions showdown. Euphemia would be credited with a supernatural intervention of her own a century and a half after her death. The 451 Council of Chalcedon, meeting at a cathedral consecrated to St. Euphemia in her native city, featured orthodox Christianity attempting to bring to heel the “heresies” disputing the eminently disputable nature of Christ. God + man? How does that work? Monophysites, a substantial minority in the east at that time, took the position that Christ had only one single nature, rather than the view still mainstream to Christianity that Christ had both divine and human natures simultaneously. Among well-educated people sensitive to historicity, it’s the sign of a gross prejudice towards the secular and the modern to consider it absurd that humans spent decades at one another’s throats over this sort of hairsplitting, but seriously … humans spent decades at one another’s throats over this sort of hairsplitting. But memo to Monophysites: do not get Saint Euphemia involved unless you’re ready for a faceful of hypostasis all up in your christology. it was God who worked, and the triumphant Euphemia who crowned the meeting as for a bridal, and who, taking our definition of the Faith as her own confession, presented it to her Bridegroom by our most religious Emperor and Christ-loving Empress, appeasing all the tumult of opponents and establishing our confession of the Truth as acceptable to Him, and with hand and tongue setting her seal to the votes of us all in proclamation thereof. Euphemia’s relics today rest in Rovinj, Croatia, and are not available for settling metaphysical debates.